The limited hours, lack of places to sit and interior glass wall cutting the Market off from the street are the real problems. The Spectator reports that Ward 2 Councillor Jason Farr wants to bring back curbside parking in front of the Farmers' Market. Farr wants staff to study the logistics of metered spots on the south side of York between Bay and James streets. Farr says stallholders are "near unanimous" about repatriating the meters, which were installed in the late 1990s, but axed when York became a two-way boulevard in 2010. Whether those spots would crowd out the east-west artery's bike lanes is uncertain, the downtown councillor said after Tuesday's planning committee meeting. "There's only so much road you can work with. … We'll let the experts report back on that." My two cents: parking isn't the problem there. They have the biggest, covered parking garage in the city 35 steps from their front door. The limited hours, lack of places to sit and interior glass wall cutting the Market off from the street are the real problems. More on this below. Having said that, there is ample space to add street parking there without losing the bike lanes, since we barely have any bike lanes as it is in this city. Cities around the world are moving to narrower traffic lanes, as they help keep traffic safer and calmer instead of big wide lanes that encourage speeding. Hamilton can adopt narrower traffic lanes of 2.9 metres (9.5 feet) in width instead of the huge, wide lanes we always love. The three travel lanes on York look very wide, but staff will know the exact numbers. If they are 3.2 metres (10.5 feet) wide, we can gain almost a metre (3 feet) right there just by narrowing them. I'll be shocked if the westbound car lane isn't something like 3.65 metres (12 feet) wide. It's huge. We can also get rid of the useless painted median on York that is just dead space in between double yellow lines. It looks to be about 0.6 metres (2 feet) wide. So just by repainting, it looks like we can gain the 2 metres (7 feet) needed for a 24-7 parking lane in front of the Market without losing any bike lanes. This scenario would see parking on the south curb 24-7 in a typical parking-width lane, not a full traffic lane, then the bike lane, then two eastbound traffic lanes. Westbound would remain the same, but a narrower car lane. Option 2 could be to do the same re-painting, but take the newly gained space to add a buffer in between the eastbound bike lane and the curb lane. Then, during non-rush hour times, we could allow street parking in that eastbound curb lane. Personally, I prefer this option as it would also meet the goals of a calmer street in front of a busy public market. Those two eastbound lanes are wide open freeways during evenings and weekends. No need for two full vehicle lanes 24-7. This cross section would look something like this, and would be the best option for enhancing public safety on the sidewalk and bike lanes. Unfortunately, public safety on sidewalks and bike lanes seem to be low on Hamilton's priority list. We rarely go to the market anymore, due to a few factors, none of which have to do with parking. The operating hours are still very limited. We have Nations and the Mustard Seed nearby with great operating hours. There is nowhere to sit and relax. We are a family of five and there is nowhere in the market for us to sit and have lunch. Those ugly white tables/chairs only accommodate two or four people, and there aren't enough of them. The vibe in the upper portion facing York feels like a hospital due to that interior glass wall, which blocks off the sounds and smells from the market. Also, last summer the sliding panels onto York were never open anytime we were there, even on beautiful days. Those panels should be open as often as possible and the interior glass wall removed so people passing on the street can hear, see and smell the great vibe in the Market. You may recall the my suggestion last year for that upper portion and sidewalk to be loaded with Paris-style cafe tables and chairs. Dozens could fit there and provide more street animation and place for folks to linger and have lunch or coffee together. Hamilton is honestly one of the worst cities I've been to in terms of creating a welcoming, inviting public realm on our city streets. We still view streets as speedways to somewhere else, instead of learning from places like Montreal or Toronto. With the bike lane and curb parking next to the sidewalk, this would help create a more welcoming environment by slowing cars and creating that needed buffer between people on the sidewalk and live traffic. There is no reason the blue cobblestone area on York couldn't be filled with patio tables, chairs and umbrellas from MacNab Street all the way over to the Library entrance. That we haven't already done this really speaks to the bigger problem that I have pretty much lost hope will ever change in this city: how we view our streets. Last Friday we visited Toronto and noticed the simple, easy-to-navigate design of the major streets we were on: Queen, College, Dundas, Roncesvalles, Ossington and so on. They were all one lane in each direction with streetcars and buses in the centre lane and parking on both sides. During rush hour, the parking is removed for two hours on Queen and Dundas, but not the others. The streets are vibrant, alive, full of business and not full of speeding drivers in cars killing the quality of life and business opportunity like we have here. York/Wilson with its wide lanes, weird turning lanes at John/Hughson and lack of parking on the south lane makes it a horrendous street, even as two-way. How many more decades of being the only dead zone in the GTHA will it take before we stop pretending it's still the 1970s? Toronto is booming, and cars can't do 70 km/h through the city. Shocking. Hamilton truly is the last city in the country holding out with these outdated, horrible ideas of city-building. The usable stretch of curb on the south side of York between Park and MacNab measures around 90 metres and includes a fire hydrant. At most it could accommodate ten or eleven cars, assuming the City installs pay-and-display terminals. Does anyone seriously think that will have much of an impact on the success or failure of the Market and its 60 vendors? More to the point, does anyone seriously think curbside parking is the best and most productive use of that space? The York Boulevard streetscape plan was based on the idea that the street would be activated by a more permeable street wall and more activites on the widened sidewalk and extra eastbound lane. That almost never happens: the glass doors remain closed and the activity remains ensconced inside the building. I'm really starting to despair this city's fundamental ability to develop a good plan and then carry it out. Trying to fix the market by sticking in curbside parking instead of making use of the outdoor space reeks of desperation planning - the reactive, unimaginative, grasp-at-the-status-quo approach through which this city has lurched from crisis to crisis over the past several years. This city is bereft of innovative ideas and is even worse at executing the poor plans they do manage to agree on. It's truly sad. God help us if Farr actually believes a few more parking spots is going to be the silver bullet. From what I gather he's meant to be a progressive. They need to borrow a tactic used by even the most lowly of nightclubs for that space and hold a line. By which I mean do as the article's writer suggested and create a life outside the building with a great public space and some crowds so that cars and passersby can see some vibrancy and want to get in on the action. People want to be around other people, give them a reason to be curious. When they install the 11 parking spots and business still stinks, can we get the bike lanes back? of course we can! it worked when the traffic didn't go down after the bus lanes were struck. Some great ideas in this article, thank you. In my opinion we could do a lot for the market and the area if we took that lane we're talking about returning to parking and used it to add amenities, tables, chairs, cafe space etc. That would do a lot more to bring people into the market area than a few more parking spaces. We've got to stop thinking that more cars can EVER solve problems. Odd hours (which I can never remember) stop me from going to the market a lot but I totally agree that the exterior is not inviting. I didn't even know there were sliding glass panels capable of being opened. But no one wants to sit beside a highway and that's what most of our main east west arteries are. They aren't designed to entice people to stop and enjoy the city, just to get through it as fast as possible. Council has to acknowledge that their are a lot of folks who actually live downtown.I think the addition of seating in front of the market would be great but would definitely help to slow traffic a bit with reduced lane sizes to make the market a more enjoyable and accessible place. Could it be opening the windows presents a contamination problem for the food court? I have never seen them opened in 9 years, and I go there almost every week. Sounds like a Public Health measure to me. We had similar closed window policies at the hospital. every market I've ever been to has open air eating areas. There are some good ideas here worth serious exploration. They would in some cases be harder to work through with people than "there's not enough parking." People seem to think this is often a problem. The market is open four days a week, for ten hours each day. The weekdays it is open, it closes at 6:00. You're right: that's not too convenient at all. I personally have not tried to go on a weekday since I once rushed there on a Thursday to get there before 6:00. When I arrived, one of the specific stores I had been hoping to go to had closed up early. When I go to the market, I don't drive there. I may not be their target demographic. I personally see the same issues as Jason: limited hours, and no pleasant spots to sit and enjoy some food or a drink. I agree that odd hours are a major drawback. If the stallholders don't want to stay open until 6pm, then change the official hours! Presumably they would get more customers from office workers in the mall if they were fully operational until 6pm, or even 6:30pm, so people could easily pick some food up on the way home from work. Adding a handful of street parking spaces is just grasping at straws, especially now they've gone back to free parking at the parkade. Some people might complain about parking, but there are clearly more fundamental issue. As with the bus lane issue, if customers are not willing to cross the street to go to your business, something is wrong (remember that customers often have to walk farther when they park at a big supermarket!). And I agree with Ryan that it is mystifying that what were supposed to be major features of the renovation (the sliding glass walls on the street, space for outside vendors in the summer) have been forgotten. Even the cafe area next to York is pretty dead looking from the street with minimal seating or activity (the cafe itself took over a year to actually open, with the space filled with cardboard boxes in the meantime). And, if they add back the street parking does that mean they will oppose the summer street vendors? Here's further proof that people would sit outdoors - during one of the Pop-Up Hamilton events at the Farmers Market, they had to move the metal seating/chairs that are usually adjacent to Sensational Samosa outdoors to make room for the dining tables. The 'GTHA'? What is that? How did your town get in there? Parking is not the problem with the farmer's market. The hours are the biggest obstacle. And even during hours, the vendor you are there to see may or may not be there. As for the street ... there is free parking at York Parkade? So King lost its transit lane because people don't want to park and cross the street, and now York will be mutilated again because people don't want to park and cross the street. Wow. Could it possibly ever sink in at city hall one of these decades that the fact our downtown streets are too dangerous for people to cross just might be the problem?? That block of York is not too dangerous to cross. It's beautiful. Being unable to is just pure lazy. Also, as we pointed out, not the real problem with the market. Anywhere else I've been, in downtown one parks in a parkade and walks just a little farther than across York to enjoy some retail and amenities. agreed. York isn't King. Perhaps it is just the lazy, entitled attitude coming out where folks think they should be able to drive through the market? And why is the suggestion always to 'remove the bus lane' or 'remove the bike lanes' to accommodate more space for cars on streets that are already overbuilt for cars? 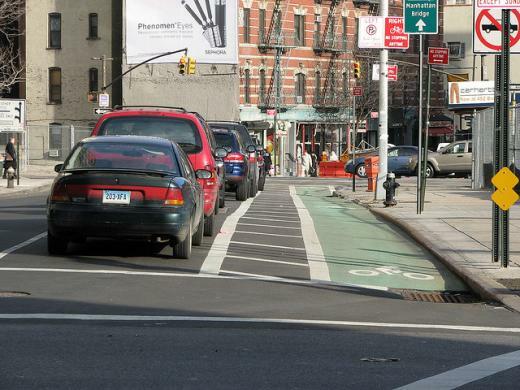 Other cities remove car lanes to make room for proper amenities. When I was a kid the Farmers Market was Awesome. We lived on Parkdale for a time and my dad would drive downtown and park in the upper levels of the Market. We would walk down and he would do all the shopping for the fresh veggies etc., for the week. It was one stop shopping. Easy for the vendors. Larger area. More vendors. More customers. Nothing fancy. A smart competitor might build a multistory parking facility with the ground floor used for a market on the weekends and out compete the new market. But I bet the City would never allow it. When I was first married, my wife raved about the market(we actually had two - one downtown and one at the Centre Mall - both great) (she was from out of town and ours was way better than the St. Lawrence Market.) But we improved it and now I never go there. A smart competitor might build a multistory parking facility with the ground floor used for a market on the weekends and out compete the new market. I have to disagree with this. You'd have to be a total fool to spend your building a parking structure in the downtown --- where is the demand? There is a glut of parking already. The big thing that ruined the market for me was the balkanized floor-plan post-renovation. Pre-reno and in the temporary space, there was a coherent food-court. Now? There is no single agglomeration of all the ready-to-eat take-out places. But either way, the City Centre and the Jackson Square parking lots are both available, and there's metre parking on Park, MacNab, and Vine. If that's not enough parking for the Market, there will never be enough parking. The big problem with Park, Macnab, and Vine is the "free parking on weekends" thing that functionally means "no parking on weekends unless you got here at 8am". If I ruled the world? Change up the floor-plan - make the street-facing fishbowl area a true farmer's market - limited hours, open air, and fresh local produce. Then make the market interior keep proper business hours and relocate stalls until there are coherent sections including a true food-court. Good point! The parking issue is a red herring. There is LOTS of parking everywhere you look. I live in the lower city and still drive to the market on weekends and I've never used the York parkade. I typically park in the underground Jackson Square lots (which there is always room). My reason for this is I want to also stroll Jackson Square, check out Nations and do some banking. Plus, with my 4 year old I'm not having to cross York blvd. I'm then faced with a disappointing layout of the market. The York blvd. section is just dead space. The Samosa stall is an island, cut off from the rest of the market and cut off from the street because of the glass. It's like going into a quarantine area - not a good vibe when you're trying to sell food. The market in the lower half has office space instead of stalls, it has a food court with few ready-made food vendors surrounding it. It has a community kitchen that may be used occasionally but, for the majority of the time, is dead space. It's just a very odd set up and doesn't encourage flow. Markets are never going to compete with comprehensive supermarkets, and they shouldn't. Markets are best when they focus on those services and products supermarkets can't - unique ready-made meals, local or fresh produce and artisanal products you can't get anywhere else. Is the Hamilton market doing well by those standards? Great article, Jason. I shake my head every time I hear the other stallholders fight for more parking. I believe the market should be open on Wednesdays to help eliminate the confusion of hours. I would even try being open on Sundays. Plus, a commitment to respect the posted hours. But what do I know, I'm just the "new" guy (as I have been told). Tuesday through Saturday with consistent hours would be similar to other sole-proprietorships downtown - a respectable 5-day work-week. Stick anybody who wants to run a 2-day produce booth with traditional farmer's market hours in the glassed-in area along York so they can be kept separate from the rest of the market. keep up the great work Jason. More 'new guys' is exactly what they need there. Excellent impactful ideas that would not be terribly costly or difficult to implement. It's nice to read about tangible and achievable improvements that can be made to the downtown. It's discouraging discussing and quibbling over plans to expedite Hamilton's Renaissance that, once they're, agreed upon, are years away from implementation, if council doesn''t drop the ball. As Ryan noted a ways back, York/Wilson is two way in name only. (twino) Has anybody considered the idea of turning the single westbound lane into a cycle track? The stoplights are already in place. It wouldn't take much to make it happen. Then have two lanes eastbound to couple with what should be only two westbound automobile lanes on Cannon St. Paired bicycle lanes all the way from Sherman to the market! Squeeze the two eastbound lanes on York to the north a bit and that leaves lots of room on the south sidewalk to create some sort of landscaped buffer for pedestrians and seating in front of the market. Yes, please open those glass walls whenever possible. I actually like the concept of converting the rest of Wilson to two-way and eventually (ya right with this council) converting Bay St to two-way so there becomes a legit E/W option around downtown without driving on King. The Bay conversion would appear straightforward to me based on traffic volume: 1 lane each way with bike lanes and left turning lanes at signalized intersections: Main, King, York, Cannon. Bay is easily the worst snarl for wayfinding in the city. It doesn't just screw up cyclists, it screws up everybody. I mean, even think about the King West corridor during the bus-lanes - if their customers came up Cannon, they'd have to do a weird zig-zag to use that wonky U-turn road onto York and then turn right on Caroline. 2-way Bay has been needed for years and years, bike lanes or no. Failing a bike-lane on 2-way Bay, I'd take a contra-flow lane on York west of Bay and then a proper complete-street 2-way conversion of Hess North. That and find some way to hook the Wilson lanes into King William and make King William into a sort of "cyclists proxy for King Street" since biking on King Street is suicide but Hunter and Cannon are too far if you're going to a destination on King. King William's traffic is slow-enough, just get it 2-way for the whole length and throw down some sharrows markers to make it clear for everybody. Limited to no vehicle traffic on king between Wellington and James, with LRT running through it, is a dream of mine. Unfortunately we're leagues away from such a reality. Hi Jason, this feels like a rerun. You posted near the same article a year ago. Agreed the Reno killed the market. Bloated and well over budget the reno tried to fix something that wasn't broken. My wife and I used to visit the market weekly, but post reno we were so disappointed we stopped going. Now we visit the market 2 or 3 times a year. After the reno we discovered the Ottawa Street market and started going there weekly. But since snatching its management away from the vendors a couple of years ago the BIA has worked hard to diminish it as well. Come May, I guess we'll be driving to the Burlington Farmers Market. The Market reno was iirc necessary for health and safety reasons wasn't it? A shortage of hand-wash stations or something? I think the architecture of the reno was good, but the actual floor-plan of stalls and seating was botched, imho. Actually, the re-opening was delayed because of a lack of washing stations (sinks). They missed them as a requirement in the re-design and then failed the health inspection. Narrower aisles, stairs that empty you into a wall, white sterile environment, poor electrical and plumbing configurations, poor traffic flow, etc. It was a complete cluserf*$k of a renovation. Hmmm, the Allan Taylor is strong with this one. Instead of adding parking, the city should install a pedestrian scramble at York and McNab, so that people coming out of the market can cross directly to the massive parking garage accross the street without having to wait through a light cycle. That intersection was originally supposed to have a pedestrian scramble before the Traffic department killed it. Now that Hart Solomon is retired, a pedestrian scramble may be an option again. A season extension to the market. Shane, I walked through the market on a Friday night when it was open late after the re-opening. Really, I'd test it on the Art Crawl night. Lots of people who might not normally be in the downtown area would be exposed to the market. Like any other store. It's not really a "farmer's market", it's a bazaar - a store. Keep store hours. Use the glassed-in area for a true traditional local produce market Wednesday/Saturday 7am-2pm. Use the opening glass to expand it in the summer just like the produce selection does. Anybody who doesn't want to keep full hours should just get a stall in there. Iirc, Waterloo does this - the "Market within a market" approach. It really is a traditional "Public Market" and always has been, not a seasonal Farmer's Market (although some stands are actually run by farming families). And that is perfectly fine. Granville Island (Vancouver): open 9am-7pm seven days a week. Atwater Market (Montreal): open 7am-6pm Mon-Wed, 7am-7pm Thurs, 7am-8pm Friday and 7am-5pm Sat, Sun. St Lawrence Market (Toronto): open Tues-Thurs 8am-6pm, Fri 8am-7pm, Sat 5am-5pm, closed Sunday, Monday. Hamilton definitely has the shortest operating hours of any of these similar markets, and the most confusing schedule. Closing on Wednesday is deadly. It doesn't fit into anyone's mental model of what an establishment's hours of operation should be. Closing on Sunday and Monday is familiar - lots of small businesses do this. But closing on an arbitrary day mid-week is guaranteed to throw people off. It means 40 percent of people who randomly decide to try out the market for the first time on a weekday will arrive to find it closed. How many of those people will bother to study the opening hours, create a new mental model for them and come back? The cognitive load isn't that big, but business decisions happen on the margins and most people will choose a business where they don't have to stop and think about whether it will be open on a weekday. But I should have included that you need to have an outdoor component to draw people into the market. Just turning on the lights on a Friday night won't do anything. like the idea, but do it right on York as well as MacNab by closing one of the eastbound traffic lanes. And utilize the dead glassed-in space at street level. Connect MacNab with the market/library building. I think this sounds like a great idea! Anything we can do to bring the market outdoors in the good weather is worth trying. I'm just disappointed that the market stopped allowing stalls to be set up on York boulevard during the summer months when the weather is good and there is lots of fresh produce. As others have mentioned, ensuring the sliding glass doors are open in the summer would also be a big improvement. Man, id love to see a regular "Night Market" running in there. If they time shared the stalls, so that day and night holders could be seperated, the current folks could keep their short hours, and another vendor could use it in the evenings. More variety and more revenue. "The limited hours, lack of places to sit and interior glass wall cutting the Market off from the street" are not the problem. lack of vision and no management are the real problems. the market will never turn around until the city is taken out of the equation. everyone wants the market to be something different because the market isnt anything anyone can get behind as it stands, including the vendors. it can't be all things to all people. it cant be a "real" farmers market, as if that ever existed, and be open grocery store hours at the same time. it cant be a busy vibrant retail place and a casual place to have lunch with a family at the same time. it cant be a place that is easy to get to by bike, transit, or on foot and be a place you can park in a surrounding surface parking lot at the same time. the market needs vision. the market needs real goals. the market needs to decide what it is going to be really good at and get down to doing it. the market needs management. I actually like the renovated version of the market a lot. It's a huge improvement over the previous incarnation -- just think back to how bad the old bathrooms were, etc. And the teaching kitchen is a really under-appreciated gem in my opinion. The kids' and adults' cooking classes are a huge factor in my family's interest in coming to the market every Saturday. That being said, I totally agree that it could be improved by removing the interior glass wall and adding seating and street-level upgrades. Friday evening Market would be way cool. While I don't find the issue of open days/hours confusing, I can see how others might. And yes, an additional dozen parking spots aren't going to make a damn of difference.